His face swollen, his eyes black and blue, a broken knee…his memory vanished: he had been drugged with opiates. “A typically brutal assault” was the resigned judgment of the judiciary police. Note: Didier may have asked for it, but that is not true of all victims. In a situation of rampant crime, there are always some fools who seem unaware of the dangers. I’m not saying he deserved it, I’m saying he let himself open to it. Since January 2006…no fewer than 1100 persons have filed a complaint of physical violence merely in the 11th arrondissement. Almost 450 victims have been attacked for no reason, or 17% more than last year. The other 650 were attacked, then robbed of their belongings by gangs. At the beginning of the summer, the local neighborhood police forces dismantled a gang of young thugs who had accumulated 17 extremely violent assaults in an area of one square kilometer, approximatively… Since October, a new wave of 35 barbaric acts, committed in the lobbies of apartment buildings, have been reported. Finally, the victims are so shocked that they give confused descriptions of their attackers who act swiftly in the space of 30 seconds and disappear into a subway station. “It’s like hunting for a gust of wind” laments one officer…Recently a mother was knocked to the ground by two unidentified persons. Her head struck the curb. She began to vomit, and developed a hematoma of the brain. She underwent emergency brain surgery at Saint-Antoine hospital. At 27, she almost lost her life for 30 euros. Note: my map reminds me that the 11th arrondissement lies between Place de la République, Place de la Bastille, la Nation, and the Père Lachaise cemetery. I only remember it as being working-class, a bit depressing, but nothing like what is described above. Père Lachaise (actually in the 20th arrondissement) was one of my favorite spots in Paris. The photo is from the anti-CPE riots last year. I cannot provide a link. One poll chases away another. Yet the one that has just been published by the Emmaüs society deserves inscribing in the memory, as it is a condemnation for France: 48% of people polled believe it possible for them to become homeless one day! This is what has become, in only thirty years, a nation that once was, and had a calling to remain, one of the richest in the world. Thirty years of socialist-communism and technocratic management has ruined and has plunged the nation’s inhabitants into anxiety and despair. This is the genuine challenge of the forthcoming years in France, and it is not the 2007 presidential election that offers the slightest chance to respond to it. Go ahead and propose to millions of French that worry about becoming homeless to comtemplate your image, as Mme Royal does, or to satisfy oneself of a”quiet rupture”, as M. Sarkozy proclaims! We can guess their reaction with little effort. And this will inevitably manifest itself at the ballot box. Which is why the electoral predictions for 2007 hold no sense whatsoever. Much as the presidential election will certainly be only one of the episodes in the great French crisis which unrolls before our eyes and whose effects will stagger the economic, social and political landscape. What the licensed observers have not understood, as they only examine the situation through the declarations of the politicians and their entourage, is that the French political and media scene is only a shadow theater. The scene currently playing has no relation to the life of ordinary citizens. And these citizens are pressed to notice at what point the few dozen individuals of both sexes which are the actors of this sinister farce are mocking them and their problems. The last known example of such contempt in the history of our country was that of the priviledged of the ancien regime on the eve of the Revolution. We know how that ended!Yet, as Tocqueville wrote, “in a democracy, each generation is a new people”. Those who constitute the ruling class have retained none of the lessons of history. They will pay a heavy price for it. The real danger that France is courting is not the clash on the near horizon, but the state in which she will find herself when she gets out of it. Our nation might just as well sink into a terrible civil war as give herself a new public-approved ruling class which will heave it outside the sinkhole it has fallen into. The worst is possible, and even probable, but it is not certain. One hears today only irresponsible demagogues in the media. However there exists a parallel world, which more than half of French homes have access to today, called high-speed internet. A website that the one you’re reading at this moment has an audience reaching one hundred pages read every month. And these articles go around the global blogosphere. The system’s media can pursue their campaign of permanent intoxication, they will come to nothing against the irresistible advance of honest and lucid information. In April 1994 the French Embassy became the setting for the formation of the extremist Hutu Government that was to organise and carry out the meticulously planned genocide of the Tutsis. Witnesses spoke of these ministers, many now facing life imprisonment for crimes against humanity, sitting in plush embassy chairs comparing notes on where the killing was going best. Their host, the French Ambassador, later helped to evacuate those extremists to Paris, away from the apocalypse they had created. The ambassador then made a bonfire of two rooms piled high with documents linking his Government with that of the Hutu dictatorship of Juvénal Habyarimana. Ségolène Royal, the French presidential candidate, was embroiled in a damaging row on a visit to the Middle East yesterday after appearing to condone a Hezbollah MP who denounced US “insanity” and compared Israel to the Nazis.Ms Royal, the first woman with a realistic chance of winning the French presidency, was struggling to extricate herself from the controversy sparked by a meeting in Beirut with MPs, including Ali Ammar of Hezbollah. In a 20-minute tirade Mr Ammar attacked “unlimited American insanity” for sending troops into Afghanistan and Iraq. He then said that Israeli “Nazism” was no better than Hitler’s Third Reich. Ms Royal was trying to limit the damage last night. She said that her interpreter had failed to translate Mr Ammar’s comparison between Israel and the Nazis. If he had, she would have walked out, she said. Ms Royal went on to claim that she had not meant to attack Americans in general for insanity but only the Bush Administration over the war in Iraq. The interested insurance companies are holding the government responsible, which is a natural and necessary direction in which to point fingers. A generation and more of a plainly failed immigration policies has saddled France with a predominantly Muslim underclass that appears permanent and permanently unruly. Can the same French government be trusted to transform France’s ethnic tinderboxes into anything socially useful? Barely. In the meantime, we know, radical Islam worked wonders on the mind of one of France’s native sons. How many more is it working on right now? 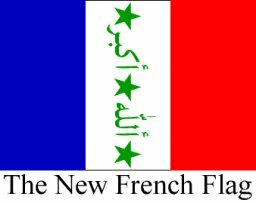 Who in the end will save France from its demographic rot (and in turn save the rest of the West from this French rot)? This past Easter JMK asked, Is Paris Praying? 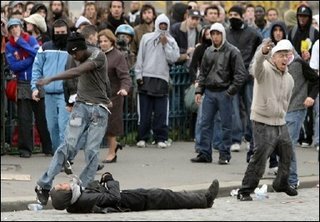 One year after the riots we ask, What price Muslim immigration? What cost? and What benefit? Or as V.I. Lenin would ask, Cui bono? (Who benefits?) Because we know that radical imams, like all implacable, warring enemies, ask themselves that question all the time…. An average of 112 cars a day have been torched across France so far this year and there have been 15 attacks a day on police and emergency services. Nearly 3,000 police officers have been injured in clashes this year. At night, the metro is typically safe, but try to avoid the stops that have long, extended hallways between platforms where unpleasant folks can easily relieve you of your goodies in relative seclusion. This includes: Chatelet les Halles, Chateau Rouge, Gare de Nord, Strasbourg-St. Denis, Reaumur-Sebastopol and Montparnasse-Bienvenue. Overcrowded subway lines where assaults are ever increasing, passengers fleeing the subway in a state of total panic, and to top it all off, the police are forced to evacuate the station.